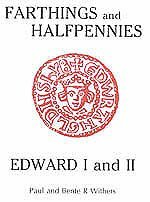 Medieval English Hammered Farthings: Edward II - Intro. The most distinguishing feature of this series is the crown. Late Edward I crowns are low and the fleurs and their lobes start at the crown (i.e. each part touches the band of the crown). The new crown of Edward II has higher lobes on the fleurs (i.e. they do not touch the band of the crown). Farthings of this series have an inner circle on both the obverse and reverse of the coin (except one variant - type 30C) and their obverse legend starts with "EDWARDVS REX" (except a variant with "EDWARDVS RX"). These coins are frequently struck on oval flans.